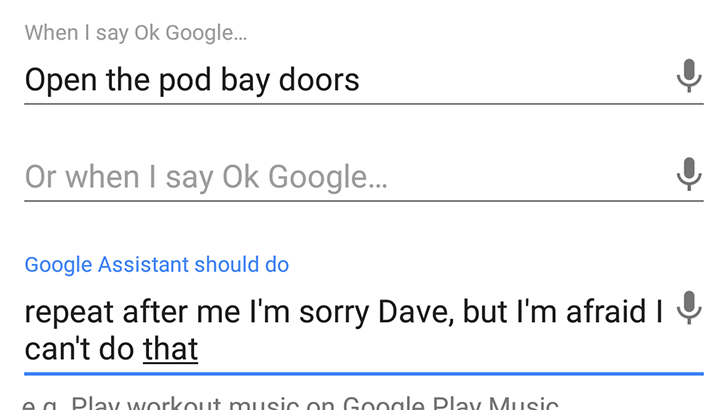 Back in May, Google Assistant added support for shortcuts, allowing you to say one thing and have Assistant perform another command. For example, I set "night" as a shortcut for starting ambient noise on my Google Home. But you can just as easily have fun with it, when combined with Assistant's 'repeat after me' command. As you can probably guess, I'm not very creative, but I'm sure y'all can come up with some great uses for this beyond movie quotes. To make a new shortcut, just open the Google Assistant settings and tap on Shortcuts. You can find the Assistant settings through the side menu on the Google Home app, or by tapping the blue button on the Assistant popup and pressing the overflow menu.